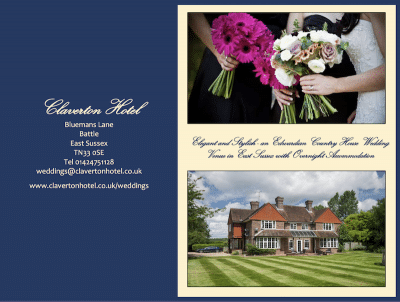 Elegant and stylish – an Edwardian Country House Wedding venue in East Sussex with overnight accommodation. Claverton House has a Civil Licence for Wedding and Partnership Ceremonies in the Dining Room for up to 30 guests. This is a warm, intimate room with a high quality sound system available for music for the ceremony. A French door connects the Dining Room to the garden where a marquee can seat all your additional guests so that they can share the ceremony with you and your partner. In addition, it is hoped that a Gazebo over the Koi pond will also be licensed (tba) which will offer a unique and romantic civil ceremony venue for “outdoor” summer wedding. Claverton House is exclusively yours on the day of your wedding giving you and your guests total privacy and seclusion. Our brand-new 1400sqft function room can cater for up to 100 guests for your wedding breakfast and 200 for your evening reception. It features a 5-metre bi-fold door that opens onto a further 1200sqft decked area outside. With its own dedicated bar & dance floor it’s the ideal room to celebrate on your special day. Inclusive of Function room hire, overnight accommodation in the four-poster honeymoon suite. Nine further double bedrooms and Full English Breakfast for yourselves and 18 further guests. Price excludes any required marquee hire, wedding catering & ceremony.